How are you today? And how was your week? First of all, I gotta say I love the new blog layout, it seemed a bit 'weird' at first, but I like it now. And I love the new rules, where we can finally read comments that are related to the topic. And yes, I did get that tattoo I talked about. But this is not a place to discuss it, so I am just going to start my weekly recap. Okay, this week had too many new updates, releases. So I will do it as I did previous times that happened - feature the most important ones and just mention others later. On Monday, we got new release to It-girls clothing store. The collection has some nice pieces, some ok, some in starcoins, etc. My personal favorite are lace stockings, also there are some pretty coats, perfect for upcoming winter. Nice, neutral colors, easy to combine for some users, not so much for some others..
Moving on. On Tuesday, a long awaited event finally occurred - MSW14 finalists were announced. There are some well known dolls in finals, and also, some of USD readers as well. I am not sure when the voting will end, and you can vote for your favorite doll once a day. All of the finalists have gorgeous dolls, and my guess suites as well, (as I did not visit each one to check) There are also some well known designers. Good luck everyone, and I know it may sound like cliche, but may the odds be in your favor! This issue of Callie's Picks, which came out on Wednesday, as usual, was a bit different than the usual re-releases. It is called 'Immortal Kiss', and if the title doesn't seem familiar, take a look at the collection bellow. The thing is, all of the clothes in collection once belonged to infamous "Mortal Kiss" Stardoll book themed store. No, don't get me wrong, Callie did not re-release all the Mortal Kiss items, but all the items released belonged to Mortal Kiss store. There are some rare and valuable pieces, which I am sure made many collectors mad at least. Still, we did not get some of the most wanted items, like infamous Pin Broche, Black long skirt, Winter Mill Jeans, Team Finn and Team Lucas tees, etc. Also, most of the items are sold in stardollars now. Honestly, I was never a big fan of MK, I even sold most of my stuff, so I am not excited or neither upset about this release. And on Thursday, we got another Limited Edition collection, titled "LE Glam Rock Fall 14". Honestly, I am not a big fan of collection. Most of the pieces just do not look appealing to me. I love shoes though. When I 1st heard we'd be having new LE collection, I was a bit upset as I am broke and non-superstar, but now I think it is better that way. Had I had the stardollars, I'd probably spend them on the stuff I don't really like, just because they are limited, as I usually do. True, there are also some dresses I adore, but still not worth sending my money on. And I was kinda expecting a Halloween themed LE. On the side note, there was a Royalty only item in Superstar only store, which Stardoll never did before. 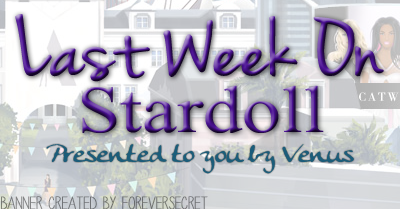 On Friday, I guess, Stardoll announced November HotBuys. Gotta say, those are my favorite hotbuys in a while. I think I'm gonna love every single item, starting with those fantastic black zipper bots, fishnet stockings, leather coat, etc. I am really looking forward to a release. I like also the black/white contrast, and the dolls are cute. Okay, time to wrap this up.. wait, not yet. I am going to mention some other interesting events as I promised. - New notification update: Now we can see who hearted and commented on your spotlight pic. I am not a superstar, as I don't have those updates, even I did submit some photos before my ss ended. - A little update in bazaar search: Now we can search for Strike-a-Pose items only. I browsed some for fun, and found some nice deals, but I never saw the infamous jeans with a blazer. - Film Theory new collection released, themed by the famous show Addams Family. Perfect items for Halloween, and as I hate recapping new decor releases, I decided just to mention it here. After all, 5 recapped items should be enough. Phew, it is finally over... I really hope you enjoyed my recap. Vote, comment, and see you next week.